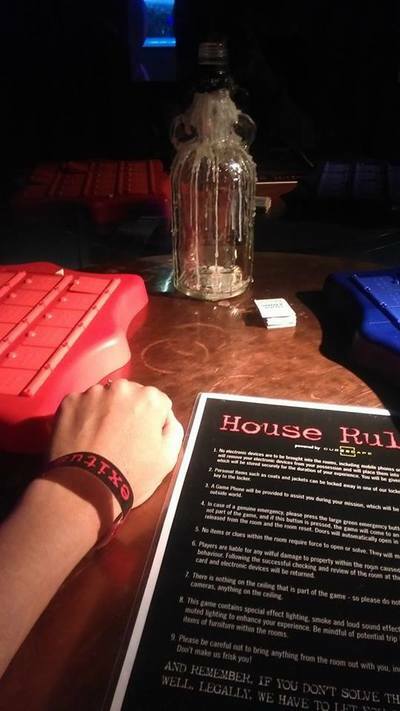 I'm not gonna lie to you, I was a little scared trying out Exitus powered by Cubescape, at Strike Bowling Bar in Glen Waverley, Melbourne's newest interactive escape room. Especially being told the theme of Exitus... was a haunted house! I gathered a few fellow School Mums who were game enough to try out an escape room during school hours, and booked in for a Thursday. None of us had any expectations, nor had we tried to 'escape' from an escape room before. That's what made this experience so special. Not knowing what to expect, and going in completely blind to the experience. 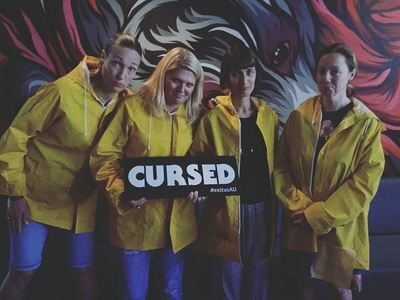 I say blind, because we were blindfolded going into the room, sporting lovely yellow raincoats, because we were guided through a rainy 'paranormal forest' to get to The Old Haunt! This was after our 15 minute briefing, when we were told we would be in the room for 50 minutes, or earlier if we were able to solve all of the clues. Our mobile phones were confiscated and bags put in a safe place. We were told 60% of teams (so far) had not escaped from Exitus, but of course that didn't mean we'd find teams of people trapped for eternity inside The Old Haunt, the room opens up automatically after 50 minutes. On entering The Old Haunt and taking off our blind folds, we were inside a compact room complete with a fireplace, a desk, an old chest, a Grandfather clock, a mirror and locked front door. The initial bit was, and is, the trickiest.. because there is nothing to say what to do or where to begin! That's where the real fun begins. Without giving too much away, what I will say, is that each puzzle is vastly different to the next, but all related to the same story, which is to re-connect lost loves from yesteryear, who are the the spirits of The Old Haunt. Each puzzle uses advanced technology to establish whether you're doing the right things to solve it. It is amazingly clever how some of the puzzles detect if you are standing in the right place, or holding the right object to take you onto the next stage. One great thing about Exitus, is the chances you have to give each puzzle a try, so that, say, if you can't solve the first mystery, you won't be stuck on it for 50 minutes, you'll have a period of time to solve it until the next puzzle is revealed. Obviously, if you figure out all of the clues on the task, you'll move onto the next one quickly. You stay inside the first room for a period of time, before the next room is revealed, and that is where your journey finally ends. We had a great time, Exitus was so much fun. A little jumpy in parts, but not overly scary. We didn't solve all of the clues (so now we are cursed!) to escape in time but we all got out in one piece. Our host Jamie ran through everything so well, and at the end, gave us a print out of our results, which we found really interesting. While we didn't actually 'escape' from the escape room, we did get 15/23 puzzles solved, so a pat on the back for all of us for that! I can't recommend Exitus enough, it's such a great activity to do, whether it be for a milestone birthday celebration or a team building exercise, book in an escape room and I guarantee you'll have a lot of fun. Bear in mind Exitus is not designed for children, the ghost  has a potty mouth! Recommended for teens 15 years plus and grown-ups. Prices: Exitus costs start from $135 per booking, on a week day, this is up to 6 people in a group.